Improve upon your normal shin guard sleeves with the extra all-around leg protection provided by the new Storelli BodyShield Leg Sleeves. You’re already wearing slip-in shin guards and shin guard sleeves, so why not add in the extra protection provided by the BodyShield Leg Sleeves by Storelli? These are just like regular shin guard sleeves, except way better, because they offer padded protection around your calf and the sides of your legs that the shin guards don’t protect. These are also just like Storelli’s top-selling BodyShield Leg Guards, except they don’t feature the ankle protection and stirrup strap under the foot. Shop soccerloco today and protect your leg from reckless challenges with the new BodyShield Leg Sleeves by Storelli. When tackles are flying at you from every direction, you don’t want to be left unprotected. Likewise when you’re sliding to win a ball or make a tackle, you don’t want a rough patch of grass or dirt tearing up your legs. You’ll never worry much about these types of injuries again when you’re wearing the new BodyShield Leg Sleeves. First things first, these sleeves act just like regular shin guard sleeves (shin guards NOT included), keeping your guards securely in place inside a specially designed shin guard pocket. The leg sleeve is made from premium moisture-wicking compression fabric to keep your muscles warm while also enhancing breathability and helping to keep your socks held up. And all around your leg covering your calf and the sides of your leg is high-quality Poron XRD polyurethane (PU) foam padding, giving you that peace of mind to ride out challenges or win the ball and avoid common impact and abrasion injuries. All this padding won’t weigh you down though, it’s placed strategically to be flexible and enhance mobility without compromising performance or protection. And with an advanced anti-microbial treatment, this leg sleeve reduces odor and reduces the risk of infections. 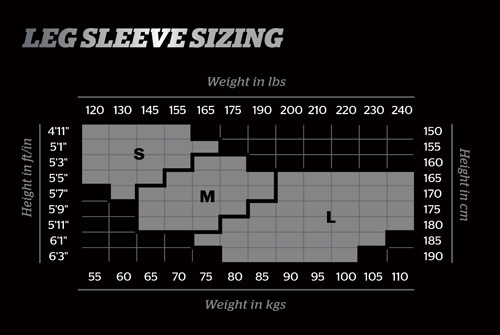 The sleeve is all black with Storelli brand marking on the front where your shin guard slides into the special pocket. Enhance your shin guard sleeve experience with the extra protection provided by the new Storelli BodyShield Leg Sleeves from soccerloco, the leading online retailer of high-quality soccer shoes, apparel, equipment and more, including the newest line of ultra-protective gear from Storelli.